We have so little of the year left, yet so much left to do. With holiday preparations and Christmas Bird Count scouting, it’s all a person can do to find a couple more ticks for the year list. Truly, this is a time of year to have your priorities in order! My priority this weekend was our annual excursion to cut down a Christmas tree. We picked a beauty, but its massive trunk necessitated a ton of work both in the field and at home in order to shave it down thin enough for our tree stand. 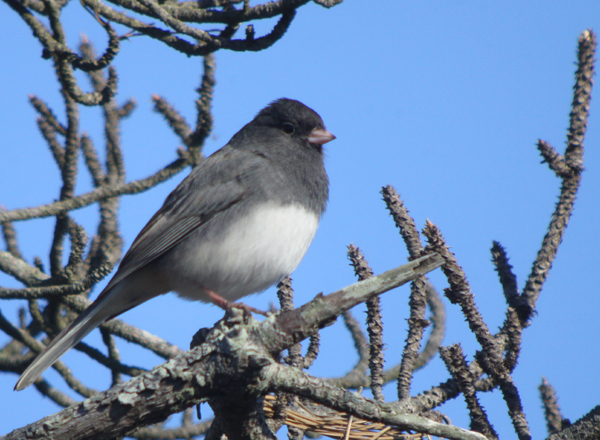 No wonder Dark-eyed Juncos flew in to watch me struggle. Corey spent his weekend scouting for the Queens County Christmas Bird Count, which was fruitful, as he refound a lingering Yellow-crowned Night-Heron and some other goodies that he hopes stick around for the next week to be counted. But his Best Bird of the Weekend was another lingering species, a Yellow-breasted Chat, which was the only of the trio of winter rarities that he tracked down at Crocheron Park.